Yune has a full schedule for the Christmas season. There will be more events announced soon. Check back for details. An two-part live event in a well-known live house in Ikebukuro, Tokyo. With lots of idols appearing, this small venue will be very lively. A morning event close to central Shinjuku. A wide range of idols in this event would make it an ideal introduction to the underground idol scene. When: December 2nd, 2018. 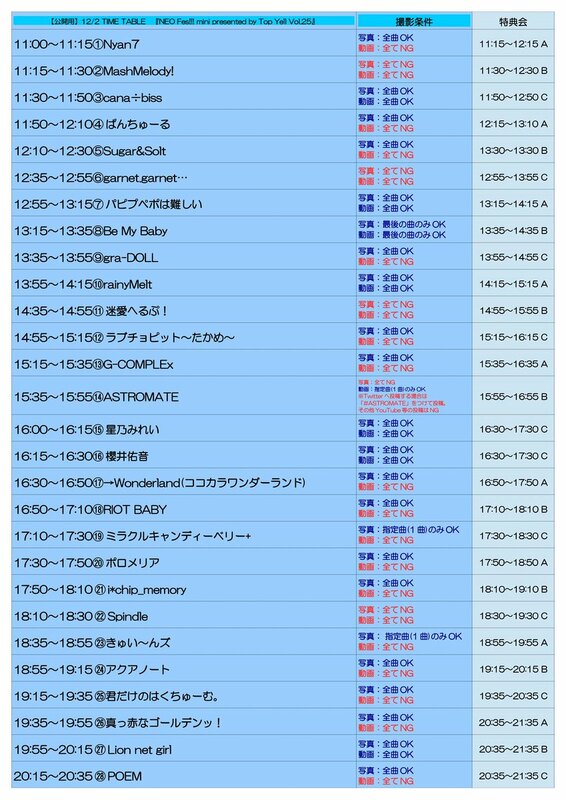 The event starts at 09:45 and Yune’s set will be at 10:25. Later, at 11:30, she will run goods sales for about 45 minutes, where you can buy her CDs, or get your photograph taken with her. 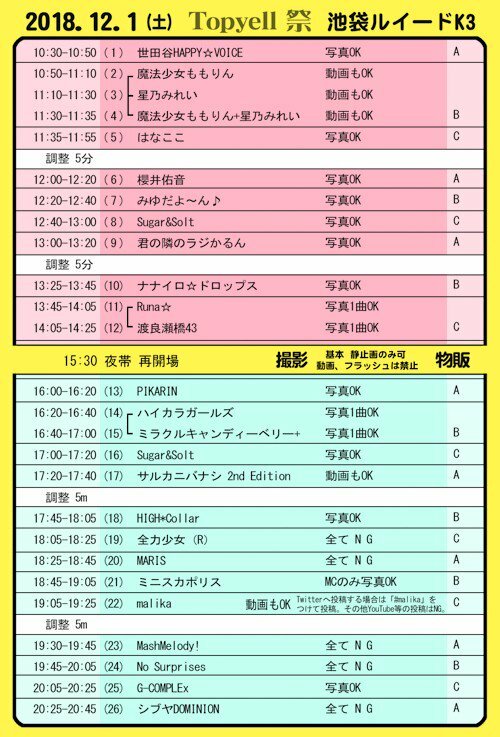 Full timetable (Japanese). Yune will perform a second live this day – see below. Where: Shinjuku Red Nose, Tokyo (map). The Red Nose venue is also called Ruido K4 and that is what you will see on the sign at the entrance, which is to the right of a Seven Eleven store. Tickets: 1500 yen with a reservation, 2000 yen on the door. An extra 500-600 yen on the door in either case for a drink ticket. You can help Yune and get the discounted rate by making a reservation for this event. After her morning event, Yune heads to mid-town for another live show at the nicely spacious Pony Canyon venue. There are some fairly well known units in this event, hopefully that will help Yune attract some new fans. When: December 2nd, 2018. The event starts at 11:00 and Yune’s set will be at 16:15. Straight afterwards she will run goods sales in the room off to the right of the stage, where you can get photographs taken with her etc. 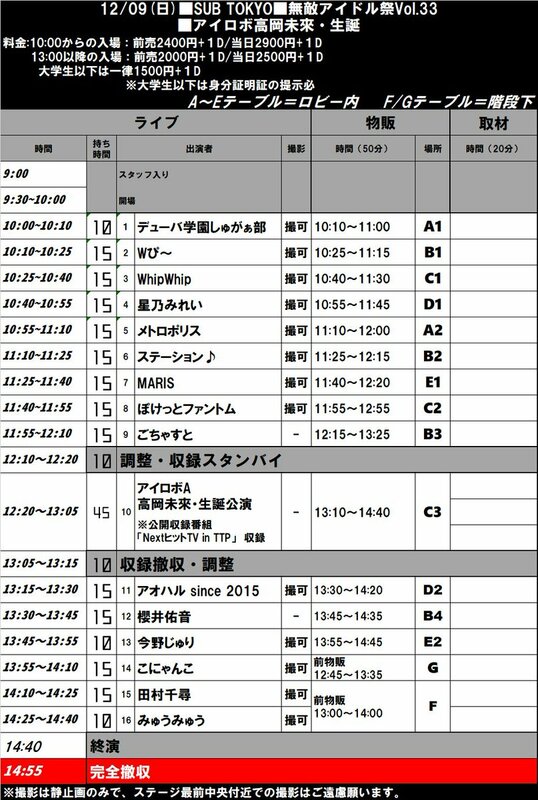 Full timetable (Japanese). Yune will be sharing merch sales with her good friend Mirei, who will be on stage right before her. Tickets: 3000 yen with a reservation, 3500 yen on the door. An extra 500-600 yen on the door in either case for a drink ticket. You can help Yune and get the discounted rate by making a reservation for this event. A two part event near Shinjuku with a good variety of idols. Yune will appear in the second afternoon part. When: December 9th, 2018. The event starts at 10:00 and Yune will be on stage at 13:30. Straight afterwards she will run goods sales in the area before the entrance of the stage, where you can meet her and get a photograph etc. Full timetable (Japanese). There will be a net-streaming talk show recorded between the two parts, but Yune will not appear. Very close to Shinjuku, but a little tricky to get to. Go to Nakanosakuei metro station on the Maronouchi line (watch out, this line has several sectors and can be confusing, make sure you are on the line that goes to Nakanosakuei). Head to the exit 1 escalator, then turn right down the street and walk about 5 minutes. It’s on the right up a few stairs. Go down into the venue and through the goods space to get to the stage door. Tickets: If you arrive before 13:00 to see some of the morning performances it costs 2400 yen with a reservation, 2900 yen on the door. If you arrive after 13:00 for Yune, it is 400 yen cheaper. Check the timetable to see how you many performers you want to see. Regardless you must pay an extra 500-600 yen on the door for a drink ticket. You can help Yune and get the discounted rate by making a reservation for this event. Yune will guest on a regular underground idol net broadcast. Line-up for the programme (Japanese). Where: Village Nishiazabu, Halle’s Mouth (map). This is a small office/studio on a back street near Roppongi. It does not look like a studio or venue from outside, see the map for the exact outside view of the building. The office entrance at the back left of the inside car park. Look for signs directing to the event floor. Tickets: 2000 yen. Buy tickets on this page. It’s a bit challenging – you will need google translate in Chrome to help. You must enter a Japanese address but you can enter a hotel address and telephone number. However, do use your own email address. Select “Convenience Store Payment” because foreign cards are rarely accepted. You will get an email with the numbers that you need to enter into a convenience store machine to pick up the ticket (you pay at the store, the clerk might be able to help you if it’s quiet). You can also make a reservation for this event using this form, but it’s not clear if you can buy day tickets. Just enter: 1. Family name, 2. Given name (first name), 3. Email Address, then press the button. A group of Junior idol friends, including Yune, will host a live party for the festive season. These girls all know each other and they have great fans so it promises to be a fun and friendly event for everyone and anyone. There’s a bit of a sad story behind this event: headline girl, Sachi, is quite ill in hospital and won’t be able to attend but will send a video message. Get well soon Sachi! When: December 23rd, 2018. The event opens at 10:30 for an 11:00 start. Yune opens the event from 11:00 until 11:30 and will return for a talk corner, collaboration song and mini photoshoot at 12:40 onwards. Afterwards there will be goods sales too, where you can meet the girls and get your photograph taken with them. Where: K&M Music, Shinjuku Store (map). A short walk from Higashi-Shinjuku station. It’s a fairly plain building, so look out for the folding sign outside advertising the event. Tickets: 3000 yen with a reservation, 3500 yen on the door. In addition 500-600 yen for a drink ticket on the door. A large complex right next to Ojiekimae station in North Tokyo. Use exit 5 from the station. The venue is the large 400-seat Ouji Tsustuji Hall on the 2F. Tickets: Reservations are not required and entry costs 3000 yen. Given the length of the event, you can probably leave and re-enter (wristband or stamp). Yune finishes off the year with a morning live at one of the central livehouses in Shibuya. A number of cool idols in this show, so worth a visit. When: December 29th, 2018. The event opens at 11:00 for an 11:20 start. 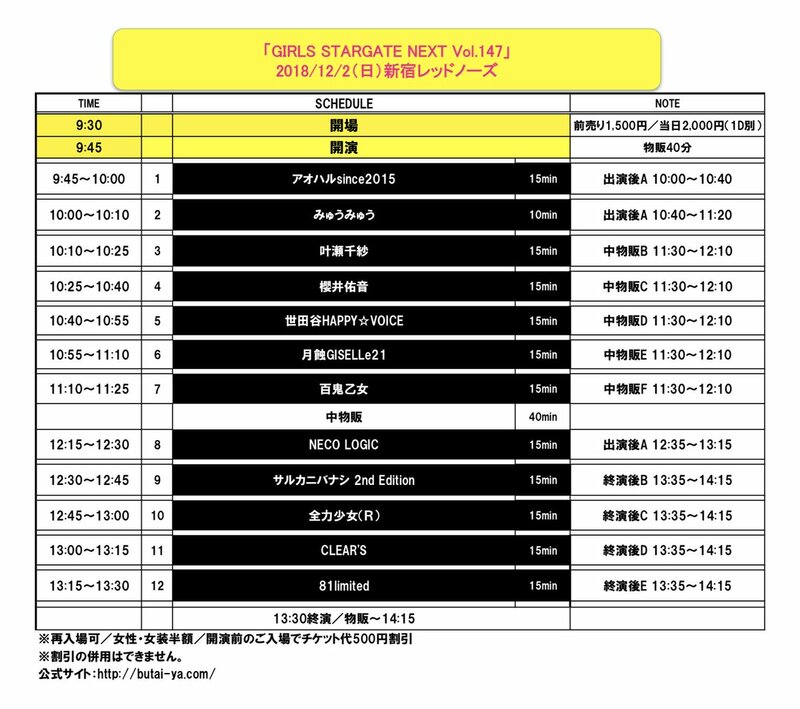 Yune’s stage appearance is at 12:05, there there is a short gap before her meet and greet at 13:00 – 14:00. Official event page and line-up (Japanese). This is one of a cluster of venues in central Shibuya. Make sure you go to the correct venue, there may be other lines of people for events in the other places. It’s right on a corner with the Glad logo above. Tickets: 1500 yen in advance, 2000 yen on the door. In addition 600 yen for a drink ticket on the door. There are no reservations for this event. You can buy advance tickets here. You will need to register on the site, use Chrome and enable translation to help. Some events have a reservation link. Use the correct one to help Yune and sometimes to save money. It is a straightforward form: 1. Family name, 2. Given name (first name), 3. Email address, and sometimes 4. Number of tickets required, then press the button.